1 Peter 1:24-24 - For "All flesh is like grass and all its glory like the flower of grass. The grass withers, and the flower falls, but the Word of the Lord remains forever." And this Word is the good news that was preached to you. The words "Scripture alone" mean that the Bible, the inspired (God-breathed) Word of God, is the only source and authority for Christian teaching. The Lutherans wrote in The Book of Concord that "Holy Scripture alone remains the only judge, rule, and guiding principle, according to which, as the only touchstone, all teachings should and must be recognized and judged, whether they are evil, correct or incorrect." Luther said: "People are not to believe me, the church, the fathers (teachers from the earliest days of Christianity), the apostles, or even an angel from heaven if we teach anything contrary to the Word of God. But the Word of the Lord should stand forever." Luther had hoped to find a merciful God, but in his study of the Bible he learned that this merciful God had found him! In Scripture we learn that Jesus is the Savior who "came to seek and to save the lost" (Luke 19:10b). Jesus' disciple John, using words breathed into him by God, explained why he wrote down the events in Jesus' life: "These are written so that you may believe that Jesus is the Christ, the Son of God, and that by believing you may have life in His Name" (John 20:31). The Bible describes its words and purpose: "But as for you, continue in what you have learned and have firmly believed, knowing from whom you learned it and how from childhood you have been acquainted with the sacred writings, which are able to make you wise for salvation through faith in Christ Jesus" (2 Timothy 3:14-15). "For I delivered to you as of first importance what I also received: that Christ died for our sins in accordance with the Scriptures, that He was buried, that He was raised on the third day in accordance with the Scriptures" (1 Corinthians 15:3-4). (Jesus said) "You search the Scriptures because you think that in them you have eternal life; and it is they that bear witness about Me" (John 5:39). "For no prophecy was ever produced by the will of man, but men spoke from God as they were carried along by the Holy Spirit" (2 Peter 1:21). "So faith comes from hearing, and hearing through the Word of Christ" (Romans 10:17). "Sola"—only or alone—is a good word to use when we talk about the gift of God's righteousness for sinners. We are beggars. We have nothing to offer in exchange for such a treasure. It is given to us only as a gift of God's grace, His goodwill, or favor, toward us. It is a gift received only through faith in Jesus. 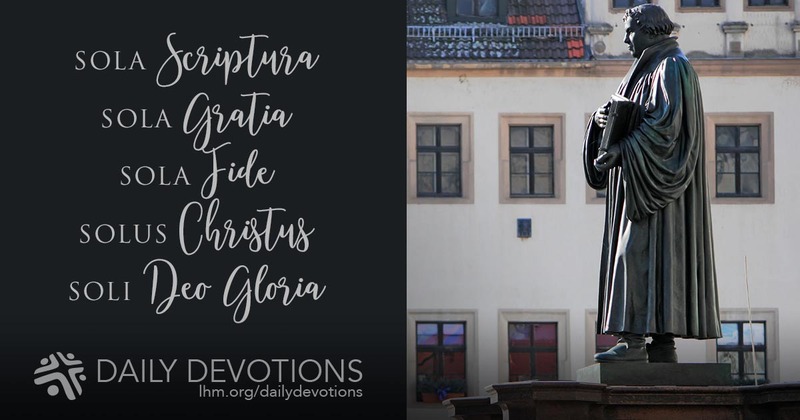 As Martin Luther discovered, the truth about this treasure is revealed only in the teachings of God's Word, in the good news that Jesus died on the cross and rose from the dead to win forgiveness and eternal life for us. The rich treasure of peace with God is ours as a free gift because the price was paid by Jesus Christ alone. THE PRAYER: Dear Heavenly Father, lead us to Your Word and let us remain there, believing it and acting upon it. In Jesus' Name. Amen.